​One week ago which seems like forever ago i arrived in delhi. I was picked up at the airport and delivered to my hotel. I had a whole day to kill which was fine by me. I just took it easy, caught up on email, chatted with my sweetie and got some laundry done. I wandered around for a couple of hours and checked out the local markets. The traffic was pretty mental but I stayed on the smaller streets. It was nice not to get hustled by the touts as this is not really a touristy area. I waited for Jes to show up for what seemed like forever on new years eve. At about 11:45 I went to the lobby because I was confident she would arrive before midnight and she did! With 10 minutes to spare. I took her up to the room and as she was unpacking the clock struck midnight and we hugged. I let her settle in for a few minutes then dragged her next door to the bar for a drink. There were some locals there dancing to Bangra music and of course we had to join in. 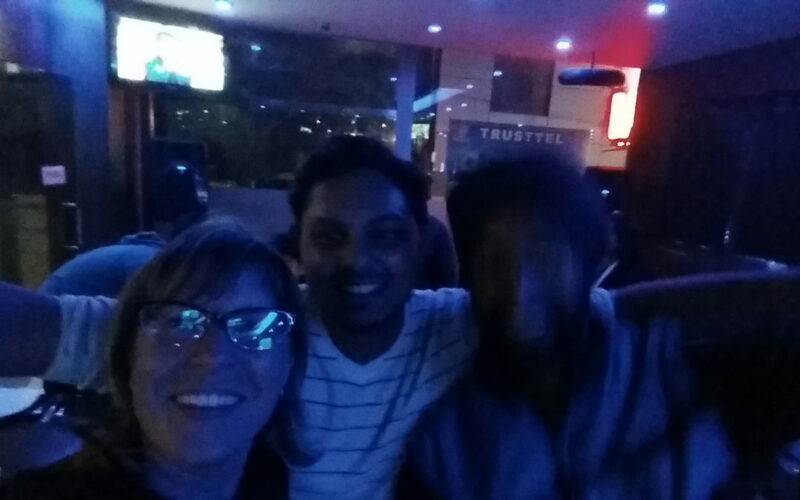 They really enjoyed that and hooted and hollered and of course took selfies of us… in exchange I took selfies too. We met three members of our tour group there too having some drinks. We toasted the new year in with some indian whisky. They were great fun. Maybe it was mean of me but I dragged Jes out on the Metro the following day. We had most of the day to kill since our tour group was supposed to meet at 6pm that night. 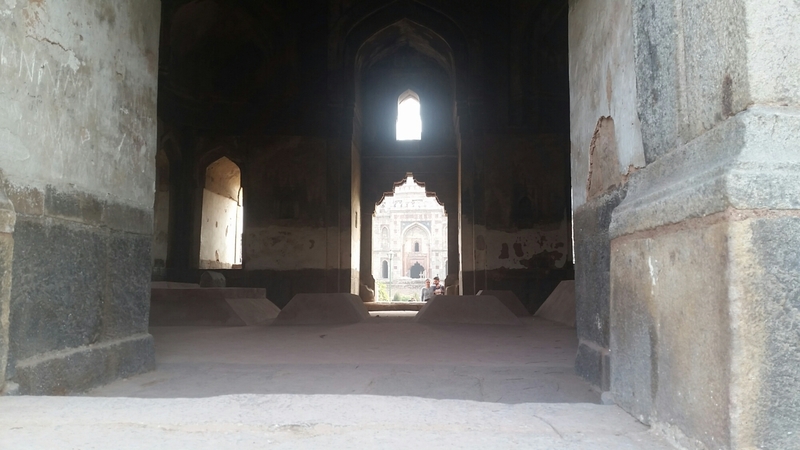 Our goal was to see huyamans tomb which was a fair ways away but doable on the Metro. We were delayed by a few things however. Jes was trying to recover from jet lag so I let her sleep in until 10:30. We attempted to have lunch in the hotel restaurant but we weren’t sure if the restaurant was open yet. The waiter when asked did the head wobble then proceeded to completely ignore us. We left about an hour later after getting zero service. Then we walked for a bit and found a vegetarian food court and I ordered more dosa masala! Jes is allergic to wheat but dosa is made with lentil flour so she was excited to order one too. It took another hour to arrive it seemed so that was a two hour long lunch ordeal. It was delicious and cheap and totally worth the wait. Navigating the Metro was an adventure. It took a while to figure out how to buy a day pass but some nice young men wanted to help out and pointed us to the customer service counter. Everyone is so friendly and helpful here even in the big cities. We ended up turning back from going to the tomb because we ran out of time. That evening we met with the intrepid tour group of 11. Our tour leader is a nice Indian woman nicknamed Appi. We had a good range of age and country of origin, including British, American, Aussie and one Swiss guy. 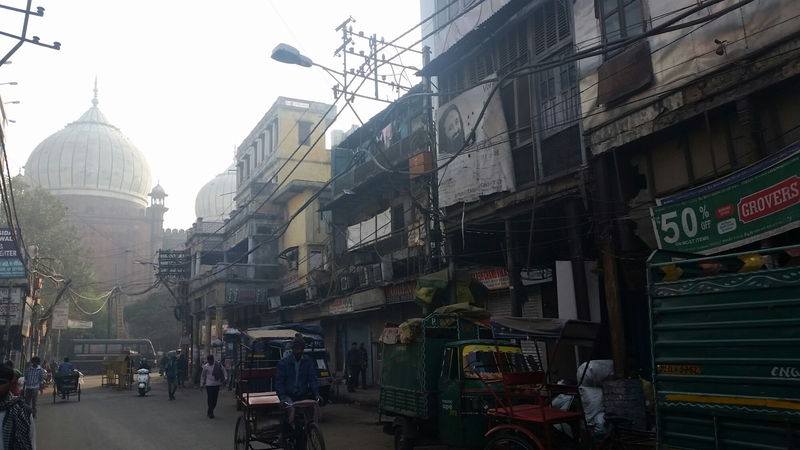 We explored the Old Delhi markets the next day. 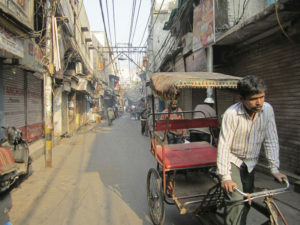 Wow it was classic run down intense with horse carts and antique hand trolleys. The sidewalks and electrical wiring were a nightmare. I tried some street food namely pouri which is puffy bread you dip in curry. Then I tried a mirangue thing scooped from a hand cart with nuts sprinkled on top. And a swirly sickly sweet honey drenched fried thing. Right downtown we saw monkeys, goats, and horses getting shod in the busy streets. A very friendly dog was staring at me wagging his tail and when I said hi he jumped up on me and I had to peel him off at which point he ran around playfully. When i looked down at my hand i noticed his claw had scratched my wrist. Of course immediately I thought I was going to die of rabies or something and Jes and Carrie had to talk me down from the ledge. I put hand sanitizer on the wound and it’s healed up just fine and I’m not dead. We visited a beautiful Sikh temple which serves food in its huge kitchen. It was beautifully decorated and clean and bright. The musicians were playing beautiful music which made Jes cry. We also visited a mosque. It was fantastic. I cheaped out and wouldn’t pay for my camera so don’t have photos lol. It reminded me of hagia sofia in Istanbul. Next day we had a free day so ventured to Lodi gardens on the Metro. This time in the ladies car!